Ok guys, I've got a lot to share with you today. There will be a new video up shortly as well, please check it out. 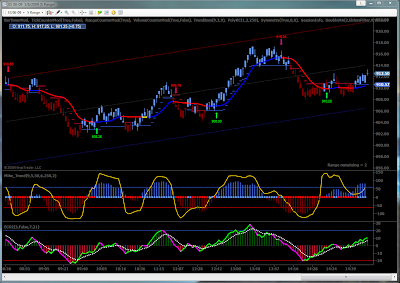 In this post I am sharing the ECO2 indicator file for download (credit goes to zoltran on the NinjaTrader forums), as well as the DoubleMA indicator (credit goes to Rollins on the NinjaTrader forums). I am trying out settings of 3, 7, 21 (fast, signal, slow). You can also see the colors I've chosen for my chart so you can follow along. I've customized my version to allow for additional moving average types. You can download my customized version below. Now some charts of today's action. First, a 5 minute chart. In the video I talk more about what you are seeing, so be sure to check it out. 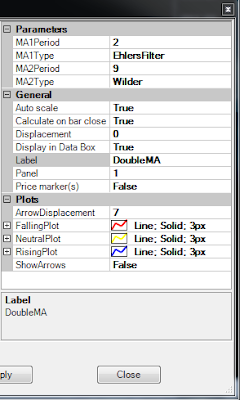 I downloaded the DoubleMA Indicator but it doesn't have Ehlers Filter or Wilder as a choice from the drop down windows. How can I get them? Regarding DoubleMA: I modified my version. But as the post suggested, I am not confident it is an improvement just yet. I only just recently started playing with it. I suggest trying an EMA 2 and EMA 9 setting, which are built-in to the one I posted. And you can get EhlersFilter in one of these, sorry I don't remember which. If you run into problems let me know, I can export mine. Thanks for sharing your indicators and thoughts...just wondering what indicator you are using that moves as a stair step on you chart? 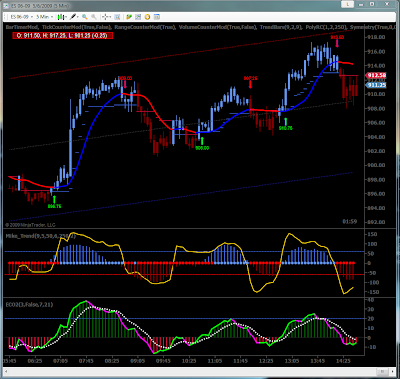 That is the stop/reversal marker, it is part of my modified version of SuperTrend, originally developed by Roonius on the NinjaTrader forums. It also colors the price bars red or blue based on settings. Once price closes below the reversal marker, the trend (color) changes. It is on my list to release on the blog for free download. Yeah your modified version looks much cleaner than the original...i tried to play around it but was unable to customize it :( ...well looking fwd to you sharing the indicator with us! Regarding DoubleMA, I just posted my modified version of it and updated the original blog post for the new URL. My version adds multiple moving averages. Regarding the TrendBars (modified SuperTrend), it is still a work in progress but will be released soon to you guys.